Wow, where to begin? There is so much to say here. Please use the comments section freely to explain what this is all about. Firstly, what are the numbers 124 and 485 relating to? Is it Liah who provided £20, £40, £20 for Kentucky Fried Chicken? Is it actually Leah or have I misread this? What are ‘true you test strips’? WHAT IS A BEANIE FISH??? This list was written in two sittings. 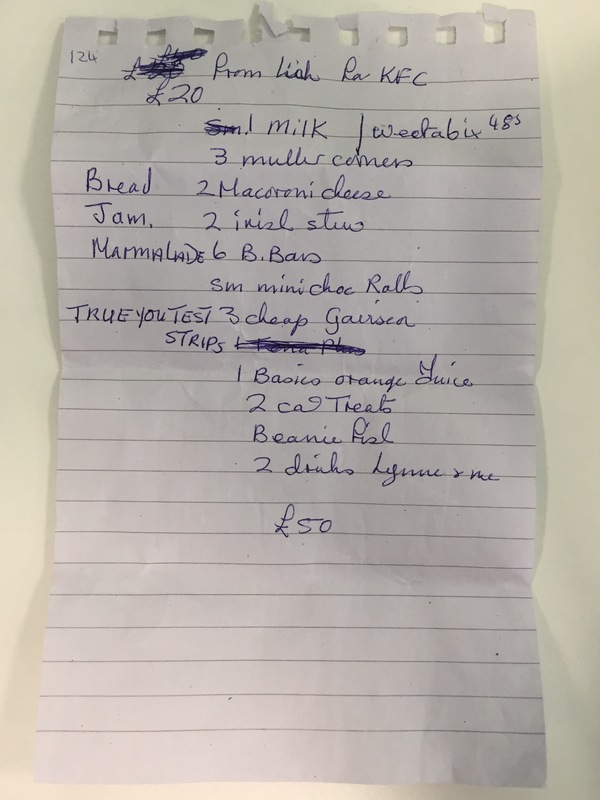 125 £20, £40, £20 from Liah for KFC, sml milk | weetabix 485, 3 muller corners, bread, 2 macoroni cheese, jam, 2 irish stew, marmalade, 6 B Bars, sm mini choc rolls, true you test strips, 3 cheap gaviscon, not sure on the next bit, 1 basics orange juice, 2 cat treats, beanie fish, 2 drinks Lynne & me. £50. This list is a real conundrum. Weetabix comes packed in 24s and 48s (not N•485). Muller corners are yoghurts, B Bars are perhaps Bounty Bar (coconut chocolate bars). sm? – what do you think SMall or Sainsburys Milk? I am guessing that Beanie Fish is a ready made meal of some sort? I think that the Trust Me test strips are more likely to be for Glucose testing rather than pregnancy testing, but you never know! They are, but they should think about changing their brand! Well done to SothamptonOldLady and LadyMissB20 on determining what the test strips are for. What a crazy list! I’m sure the shopper knew exactly what e/she was going to buy.